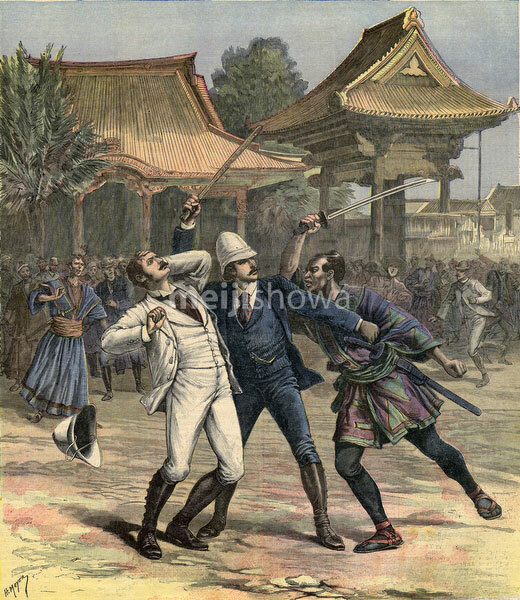 Illustration of the failed assassination attempt on Russian Crown Prince Nicholas Alexandrovich on May 11, 1891 (Meiji 24). The attempt occurred when Nicholas was returning to Kyoto after a trip to Lake Biwa in Otsu, Shiga Prefecture. He was attacked by Sanzo Tsuda (津田三蔵, 1855–1891), one of the escorting police officers, who stuck his face with a saber. Nicholas’s cousin, Prince George of Greece, parried the second blow with his cane, and saved his life. Tsuda thought Nicholas was spying to prepare a Russian invasion. The event became known as the Otsu Incident (大津事件, Otsu Jiken). The illustration is fictional as Tsuda wore a Western style uniform and hairstyle.